Juventas New Music Ensemble is thrilled to announce that we have received a grant towards Opera Project 2012 from Free for All Concert Fund, Inc. All performances of The Fiddler and the Old Woman of Rumelia are now FREE! Reserve your FREE tickets today! Please note that reservations made through the website and over the phone are still subject to the $4.25 service charge per ticket. Patrons can avoid this fee by reserving tickets at either of the BCA/Calderwood box office locations. 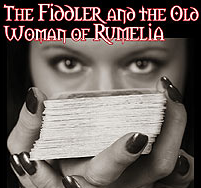 Juventas New Music Ensemble is proud to present the world premiere stage production of Ketty Nez’s newest opera The Fiddler and the Old Woman of Rumelia. In this mysterious melancholic fantasy, a spry fortune teller and a dashing, murderous outlaw cross paths with local villagers, weaving surprising folk stories and colorful characters from faraway places with their own dark pasts and visions of the future. Explore the blend of new music with folk-inspired tunes, where the mortal meets the immortal all in the edgy style best known as Juventas. Click (here) to get tix online. 0 Response to "Free: Fiddler and the Old Woman of Rumelia"